A selection of photographs of footpaths and bridleways, taken while walking from Blickling Park to Moorgate, Fring Wood, Blickling Mill and back to the park. Throughout June and July our Pathways to History project has been making steady progress, with the results of fieldwork surveys coming in from all over the county. We’ve also been invited to visit a number of parishes to take part in walks with local groups, making the most of an unusually hot and dry summer. 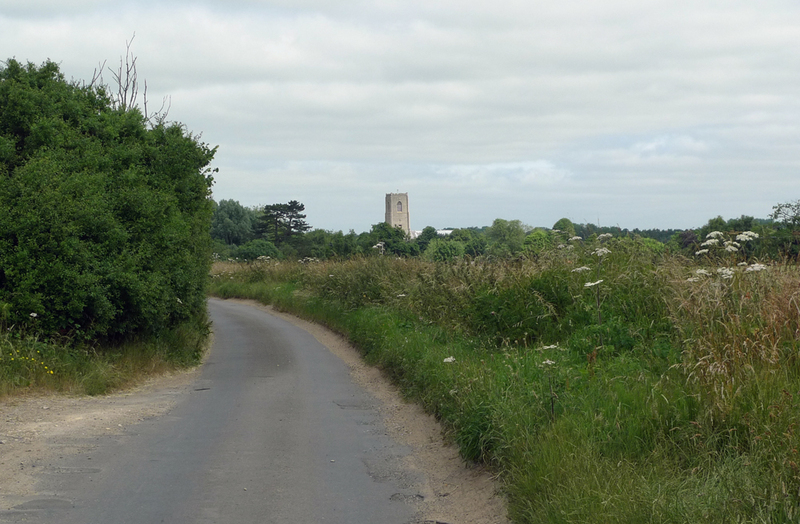 Back in June we went to Felmingham and Beachamwell, parishes at opposite ends of the county but with some similarities in landscape terms due to their sandy soils and heaths. Until the nineteenth century many of Norfolk’s heathlands were criss-crossed by dense networks of tracks, many of which disappeared as parishes were enclosed. Walking from Felmingham church to Bryant’s Heath we followed one such track (now a public footpath) which has survived, crossing the heath and then leading on towards North Walsham. A number of other tracks can also be seen on the heath, some of them significantly sunken. Footpath between Felmingham church and Bryant’s Heath, NE Norfolk. The landscape around Beachamwell, as with many parts of Breckland, is today dominated by large scale agriculture. 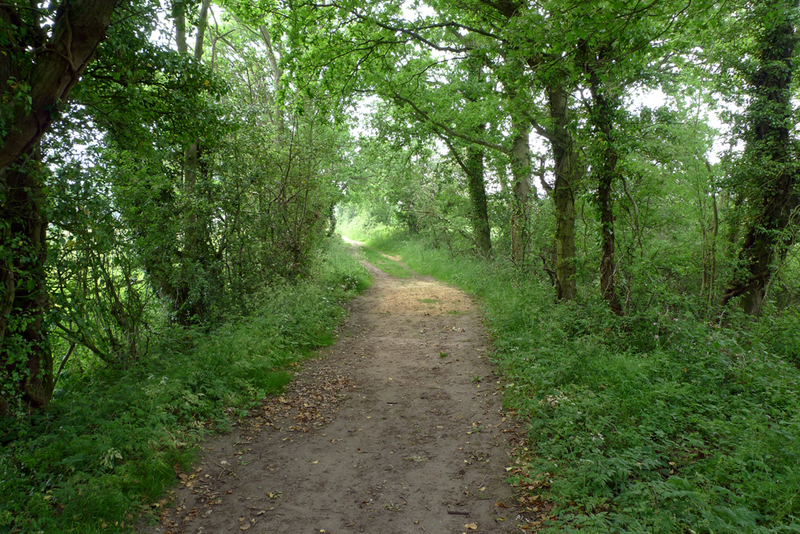 However, it is also covered by an extensive network of footpaths, the history of which is currently being researched by a group of local people working with the CPRE. We enjoyed an atmospheric late evening walk around some of these paths and lanes via Shingham and what was once Beachamwell rabbit warren. Once again we were struck by the richness of some of the lanes in terms of ancient trees and boundary earthworks, in a landscape more readily associated with the hawthorn hedges and conifers of modern fields and plantations. Beachamwell contains numerous important archaeological sites and it will therefore be interesting to see how the routeways within the parish have both influenced and been shaped by past activity. Looking back towards Shingham and Beachamwell from a track leading to Langwade Green. 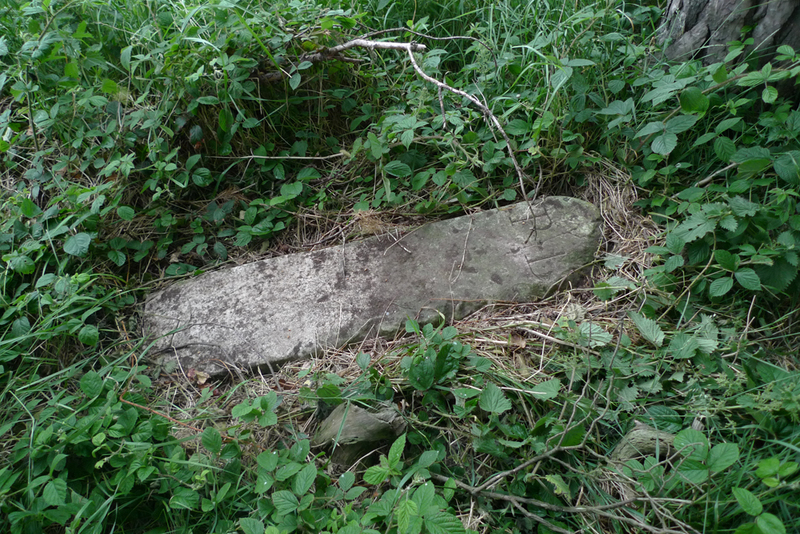 An eighteenth-century boundary stone (marked ‘PB’), now lying in a hedge near Beachamwell. At the start of July we spent a morning exploring paths and lanes in Reepham, along with 30 eager assistants from Reepham Primary School’s year 3 class, the Avocets. Our walk included a very impressive holloway between Mill Road and Whitwell Road (see below) and an oak pollard on Back Lane with a circumference of 7 metres. The class provided plenty of thoughtful observations and more than a few challenging questions! In addition to working on the Pathways to History project Reepham and Beachamwell (along with Thompson and Horning) are also taking part in the CPRE’s Connecting Threads: Exploring Our Footpaths project, which aims to “raise awareness and enrich knowledge of public rights of way so that local communities value them and (literally) explore them more, and are encouraged to engage in monitoring and protecting them”. You can find out more on the project website. Our most recent visit was to the parish of Carbrooke, one of many splendid examples in Norfolk of a small village with an enormous parish church. In the field to the south of the church are the earthwork remains of the commandry or preceptory of the Knights of St John. 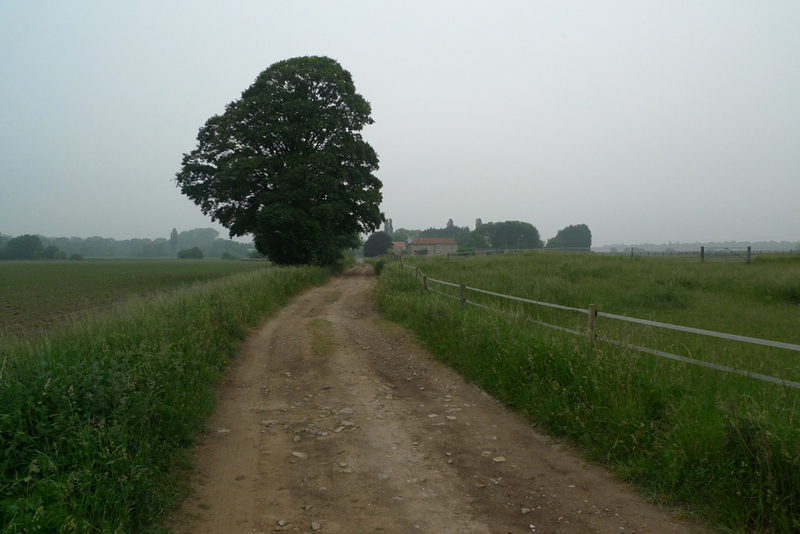 As with Beachamwell, it will be interesting to see what connections can be made between such a significant site and the current pattern of roads, lanes and paths in the parish. Looking north towards Carbrooke from the end of a short footpath running between Summer Lane and Mill Lane. Last weekend we were busy working with a number of local history groups as part of our Ideas Bank project, supporting groups who have secured an All Our Stories grant from the Heritage Lottery Fund. On Saturday we ran a workshop on ‘Writing Up Your Research’ in a very sunny Cromer. We talked about different kinds of writing, how to write for different audiences and how to get the writing process started. There was lots of discussion about how to write as a group, and the importance of editing and reviewing work. The groups who attended (Quatrefoil, West Deeping Heritage Group and Little Waldingfield History Society) went away looking forward (we hope!) to getting stuck in to the writing-up process. 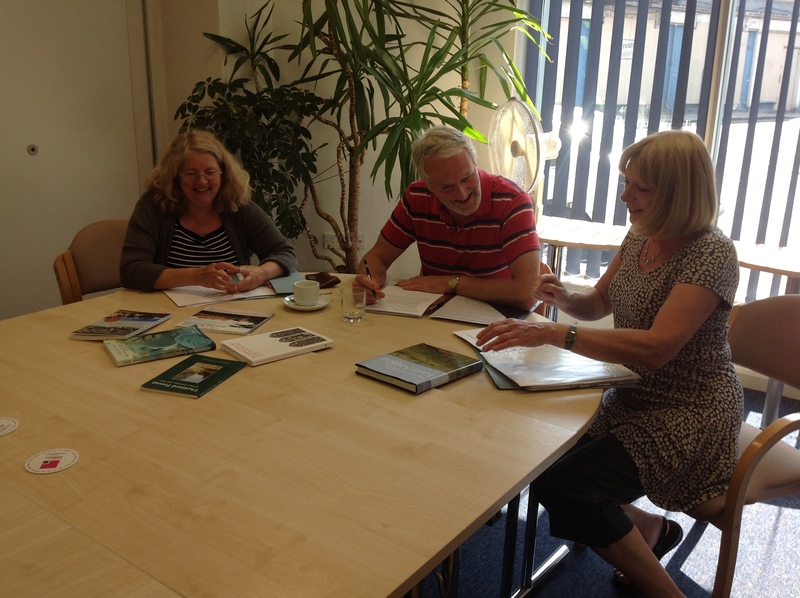 Andy and Sue from Little Waldingfield History Society and Maggie from West Deeping Heritage Group at the ‘Writing Up Your Research’ workshop. We will be running a number of other workshops over the summer, and into the autumn, for the groups we are working with – more details are on the Ideas Bank blog. On Sunday, along with a handful of students, we went down to Suffolk to help with the Hoxne Heritage Group’s community dig in collaboration with the Suffolk Archaeology Unit. Hoxne is well known for its association with King Edmund, and for the Hoxne Hoard, a huge number of Roman coins and other artefacts found in 1992 by Eric Lawes, who was helping with the dig this weekend. 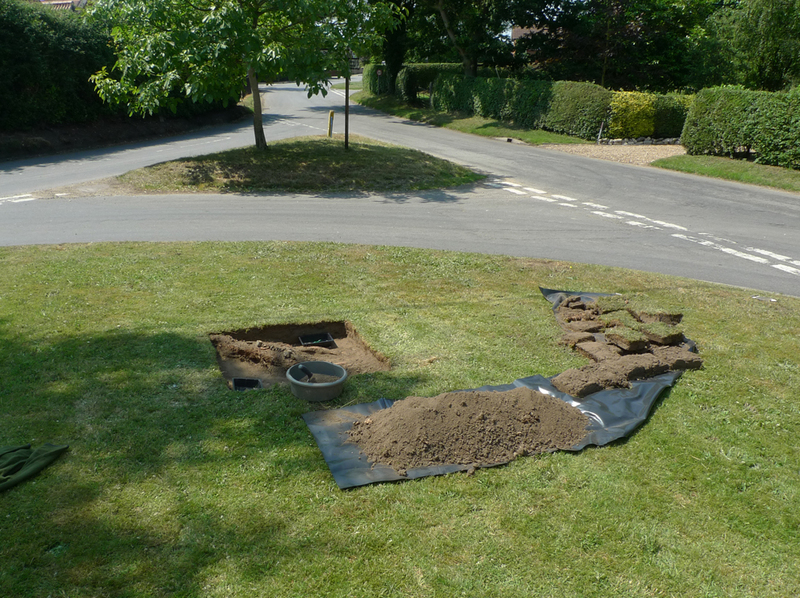 Test Pit 29 – opened by Jon and Simon, who found a large tree root and a handful of finds. 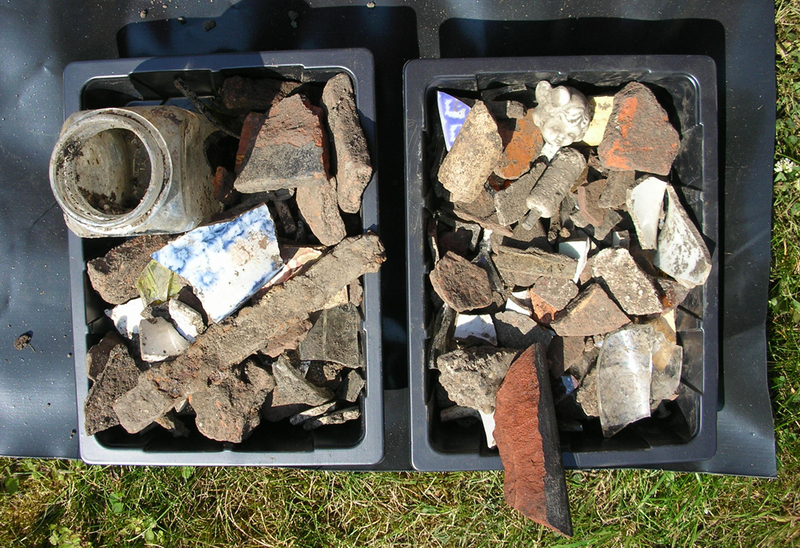 Sarah and Imogen hit upon a 19th and 20th century rubbish dump in a back garden which contained a mass of finds, including a handful of late medieval pottery sherds amongst the willow pattern. Josh helped with a test pit in a back garden near the boundary of the medieval park, before carrying on with Sarah and Imogen’s pit on Monday. 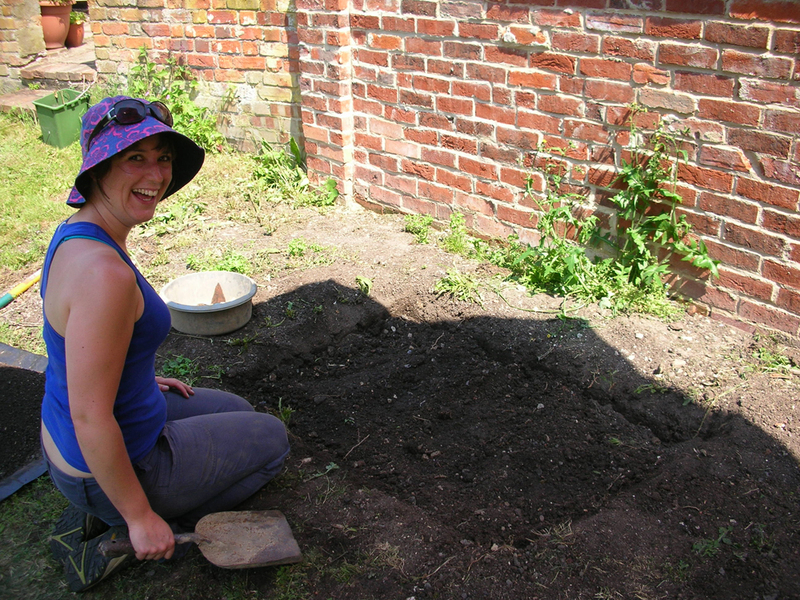 MA student Imogen Wegman working on Test Pit 4, which contained lots of 19th century pottery. Two trays of finds from Test Pit 4 – mostly post-medieval and modern. The full results of the dig will now be analysed by the Suffolk Archaeology Unit, but medieval pottery was recovered from a number of pits. Hopefully, we’ll be able to share some of the results here soon.